This 29-year-old is a typical Taurean with a cool and calm exterior but underneath he has the boyish charm that will melt your hearts. While a lot is being said about his relationship with Natasha Dalal, when quizzed about it the actor blushes like any other youngster and avoids the question. He is rather comfortable speaking. What homework did you do for the role? I mingled with the locals there to understand my role better. I had to learn a bit of Arabic and I learnt it from my driver there. The driver was a Pakistani settled there and he has three sons and a daughter. He is planning to get her married this year. He told me about their culture, their food habits, the police and about how a man leaves his country and he becomes one with another country. He used to listen to Nusrat Fateh Ali’s songs. I started loving their underground music. He knew more than I knew about our music. Is there a hint of patriotism in the film? How patriotic are you in real life? It says a lot about patriotism. I would love to do anything and everything for my country. I trust there is no country in the world where there is so much of freedom, with so many different religions existing under one roof. Tell us about Rohit? Was he lenient towards you? Rohit Dhawan is truly the protective elder brother I will always want to have. He has also pushed me into doing things. He wanted me to become an actor. When I was assisting Karan Johar in My Name Is Khan he used to tell me to work hard and prove myself as this was my first audition. He often told me that Karan is a big director and if he would not notice my talent he will never give me a chance. "Make sure that you are seen and heard. Show him your talent,” he would say. Dad has a soft corner for me even Rohit has but he is a lot more stricter. I am more scared of him as he has this very new age professional approach to work. He treats everyone equally on the sets and if I was late he would shoot other scenes and pack up for the day. He does not care if I am the younger brother. But at the same time, I realise that whatever he does is for my betterment. He wants me to do better and push the envelope. I have even fallen unconscious on the sets. He wants me to do the best. He has always been like that. Even during my younger days he would keep a tab on what I was doing and what I wasn’t. If he saw me passing time with girls he would go and complain to my mom and punish me by making me pack his school bag according to the time table. So you were a brat in your younger days? I was a terrible brat. I troubled everyone a lot. The girls in my school and college never liked me as I troubled them a lot. I was very immature at that time. If given a chance I would like to apologise to them some day. How was your camaraderie with John Abraham? I have known John for the longest time as he shot with Rohit during Desi Boyz. He is close to Rohit. John doesn’t take himself too seriously, he will wear slippers and tracks and is always very simple maybe because he is not from the industry. He is not filmy. We had our own boy gang and we would take bets on how many takes Rohit will make us take that day. We would keep a track and make notes in a book. I won Rs.1500/- from our bet. John bought me protein bars. Even when we were shopping in Abu Dhabi I chose something for him and he bought me a similar one too. I ended up buying a protein shake for him. We went out for dinners and his wife Priya used to join us at times. She is very intelligent and well educated and they make a lovely pair. What are you focussing on right now? Right now my focus is to work hard and experiment with different roles. I am yet to do a Horror and Sci-Fi film. But I am yet to understand my strengths and weaknesses. I have not understood the formula for superstardom. I believe that the Khans are still superstars. I don’t think we will replace them. I don’t want to replace anyone. 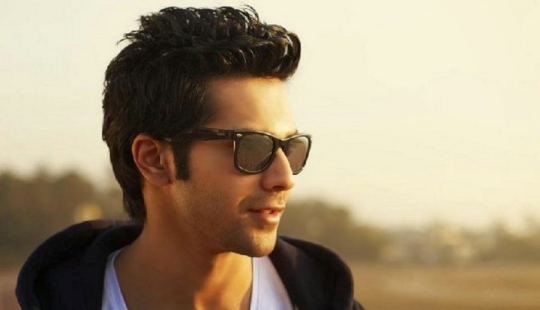 I want to be Varun Dhawan till the end. Are you open to biopics and whom would you want to play? I want to play a sports character or do a period drama or even a politician from the era when our country achieved freedom. I am also interested in regional cinema. What is the USP of Dishoom? Akshaye Khanna in a negative role is the USP of the film.